Choosing a platform for the website is a very crucial thing. One must always choose a platform over which it can exercise its full control. Choosing from among the websites which provide for the development of a website via drag and drop method does sound lucrative but, in many cases they don’t provide full control over the website which makes it difficult for the website to attract the attention of the Google. Though, the drag and drop websites are easy to make and can be made within hours and that too without any technical knowledge of algorithms but, the overall control is lost which is very important keeping in mind the method of indexing the website or the loading speed for any webpage on the website. Another mistake that the website developers can commit is uploading material which is not relevant or as per the interest of the users. Even as per the norms of Google since its very inception, preference has always been given to the content rather than other factors. As a matter of fact, the same was also revealed by Google for a long time using a simple sentence that the website with the most relevant content will appear on #1 slot for any given search. For the same, the websites can ensure that the material being uploaded is not only comprehensive but, well written as well. So the content needs not only to be unique and direct but should also contain in-depth knowledge on all such topics which are being actively searched by the users. One of the most important features for any famous and successful website is the quick loading time. With the advancement in technology, the business leaders have realized the fact that in order to attract and increase the customer base, the website needs to have photographs, videos and other graphics as well. But, the website developers certainly need to maintain a balance between these features so that the loading time of the website can be kept in check as well. If a proper check is not maintained then the chances of losing the customers are enhanced. The loading time can especially affect mobile users depending upon the memory and speed of internet connections as well. There are a number of steps that can be taken to reduce the loading time for the website. This can include the compression of the size of the pictures, keeping a check on the caching programs and by also limiting the number of front-loading plugins. Further, there are a number of tools as well which can be used by the developers of the website in order to analyze all such problems which can hamper the smooth functioning of the website. One of the biggest omissions in search engine optimization or in other words SEO is the lack of navigation not only for the customers but for the search engines as well and also for the neglecting the importance of navigation. The website that is being developed should not be confusing and each effort should be made for it to be able to dispense any information within 2 to 3 clicks. Further, each page should be separately labeled along with proper formatting making it easier for the customer to go through it. The questions which are generally asked by the customers can also be clubbed together so that there is no need to answer them again and again. This will also help the search engines to easily map out the contents for relating one page to that of the other. Relevant page titles and meta descriptions are very important for a website as there are great chances of improvement in the ranking done by Google algorithms. So, in the development phase of a website, this feature should not be missed out at any cost. Another major mistake that many website owners think that backlinks will instantly improve their ranking and hence, purchase a lot of backlinks. They don’t realize that the links they have purchased are from flagged sites which Google hates the most. So, it is important to earn a backlink which positively affects ranking and appear on websites with high authority that have quality traffic. E-commerce websites are now paying undivided attention in personalizing the user experience and are doing everything possible to make the users comfortable buying products from them. In such a time, if a website is not researching and providing answers to the questions of its customers, then it is a big blunder. To enhance the customer experience and to improve the conversion rate, it is important to address most frequently asked questions by the potential customers by looking for what types of questions trigger a search for the keyword you have targeted? What common answers visitors need to know before making a purchase from you and much more. Many e-commerce website owners treat SEO as a “Set it and forget it” tactic while this is absolutely wrong. Relevant content about the product and services should be updated continuously and add customers feedback and reviews to the website. Timely and continuous updates about the content should be made to the website to improve the search engine rankings. 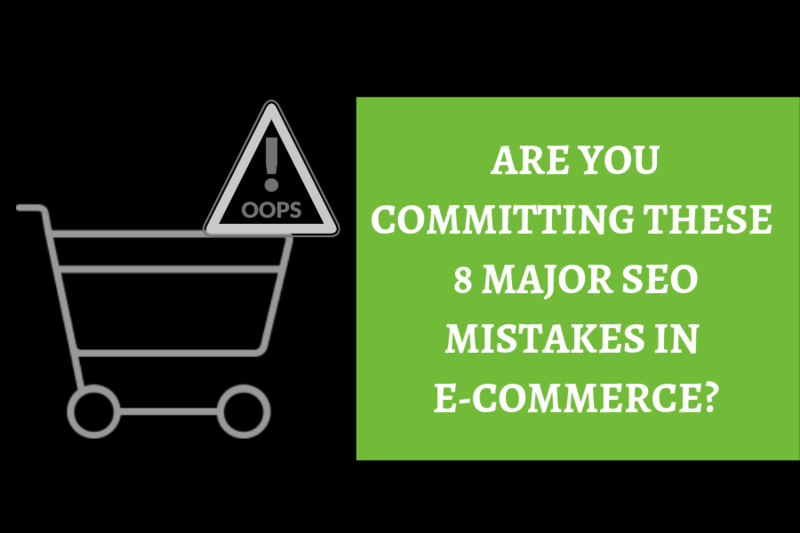 These are the SEO mistakes which many E-commerce website owners commit but should be avoided without any doubt. Avoiding these mistakes will ensure that your SEO campaign is heading to the right direction.